Turning smart design into pretty code requires a skilled, detail-oriented and determined talent. You need good developer skills but also understanding and a desire to learn more and more about design. Filling these shoes isn’t easy. Yet we found the right person. 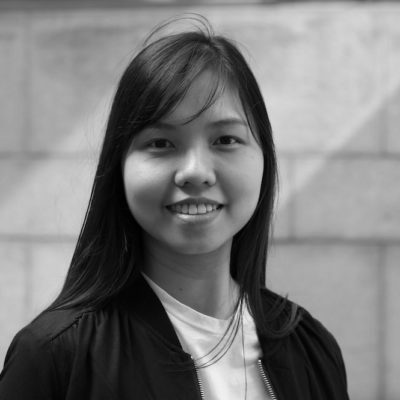 Happy to introduce our first ever female front end developer, Anh. Hi there! I’m Anh. I’ve been living in Finland for more than 7 years. I come from Saigon, the busiest city of Vietnam. I started my journey with the awesome friends at Pixels two months ago, as a front end developer. I still remember the very first day I came to Finland, for my first degree in Business Administration in Valkeakoski town. Trees around me. Squirrels everywhere. Only the sounds of birds and bees. I was 21 and I had never had so much quietness and free time in my life. Back then I baked my first orange cake and knitted my first scarf. In a couple of months, I read more books than I had in the previous three years. I thought it would be boring, but before I realised, I already learnt to appreciate it. The quietness calmed the reckless part of me down and encouraged me to step back and think. I spent four years in my first Bachelor degree, left school with a different mindset and a lot of hope. I can do more. And I want more. I didn’t think for long. I quit the full-time waitress job, applied for another Bachelor degree in IT, while self-studied to write my very first HTML code. I put in 200% of effort, because I knew I had a lot to learn and no time to hesitate. I knew I was a latecomer, but I believed in “better late than never”. It’s been almost two years since I made that decision, and I’m writing more and more code everyday. Surprisingly, I’m thankful for my business background, as it helps me understand clients’ needs and decisions better. And from my perspective, coding is not much different from doing business: it all boils down to the efficiency.